Paula wrote: I’ve noticed the numbers inside the recycle symbols under plastic containers. What do these numbers mean? In Dr. Hulda Clark‘s latest book, “The Prevention of All Cancers,” she wrote about HDPE Plastic being the best kind for food and beverage storage because it is the most dense out of all plastic materials. This means that the chemicals making up the plastic does not leak into the beverage or food that it contains. Ever notice that plastic taste you get when drinking water out of a clear plastic bottle? Your taste buds are telling you that your water contains more than just H2O, it also has traces of the chemicals leaking from the clear plastic container you are drinking out of. Because of its density, HDPE Plastic is used to make milk containers, bottles for nutritional supplements, and basically anything that needs to be protected from any chemical leakage. As consumers become more savvy about the products that they buy, there has become a demand for HDPE food and beverage containers for the home. 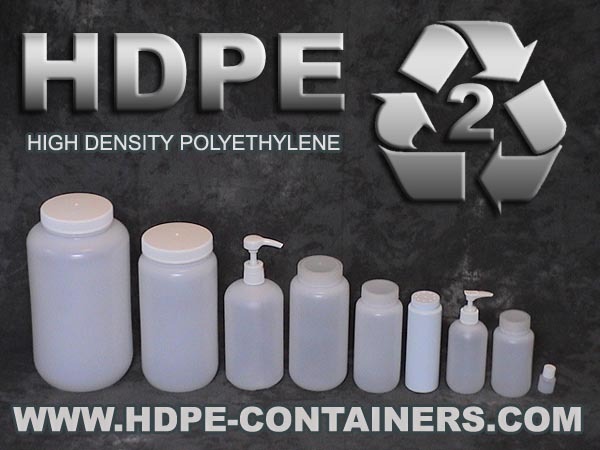 There are now a variety of HDPE bottles and containers that can be bought for household use. We found a few of these and made them available in our shop at HDPE-Containers.com.